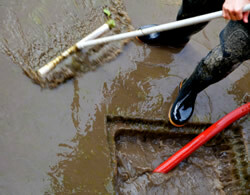 Drains are never a problem until they are faulty or stop working and when that happens, you need them unblocked fast. Inevitably grease, scale and silt build up over a time reducing flow and cause a blockage. Using an effective technique like high pressure jetting will soon have your drains free flowing again with all the debris flushed out. Past experience shows that our fast service and competitive prices are the key to our success. Wherever you are located, you are ensured of an excellent and reliable service, supported by highly trained staff with fully equipped vehicles carrying the latest machinery to clear the stubbornness of blockages. Our on-going commitment to do the job properly and professionally is very successful and vast knowledge of the areas we cover has gained us a well known and trust worthy reputation amongst our clients. Kwik Jet are dedicated to providing our customers with excellent service and we welcome you to get in touch if you require or have any concerns with any of the services that we offer, such as blocked drains, high pressure jetting or rodding. A member of staff will be happy to help.